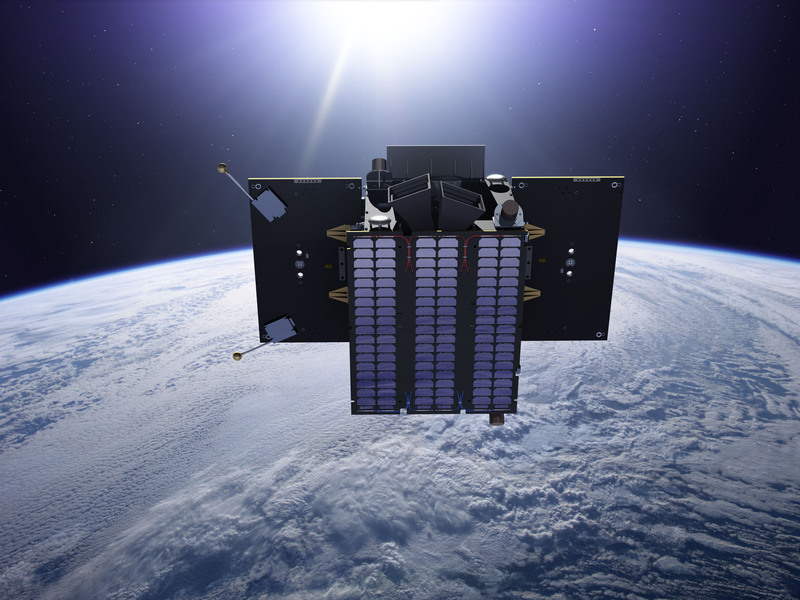 The PROBA2 spacecraft, in addition to showing off the capabilities of a variety of new technologies for spaceflight, carries two Sun-observing instruments, SWAP, an ultraviolet imaging telescope, and LYRA, a radiometer which measures the intensity of light in various wavelengths. Together, these two instruments provide critical information about the conditions that drive space weather in the near-Earth environment and exciting observations of the Sun that have led to dozens of publications in scientific journals and even more presentations at international scientific conferences. In celebration of PROBA2's fifth birthday, the PROBA2 Science Center team at the Royal Observatory of Belgium has collected several of the most important observations made by SWAP and LYRA during PROBA2's five years in orbit. The ever changing Sun: Deep observations from SWAP reveal the dynamics of the Sun's atmosphere on never-before seen scales in both time and space. 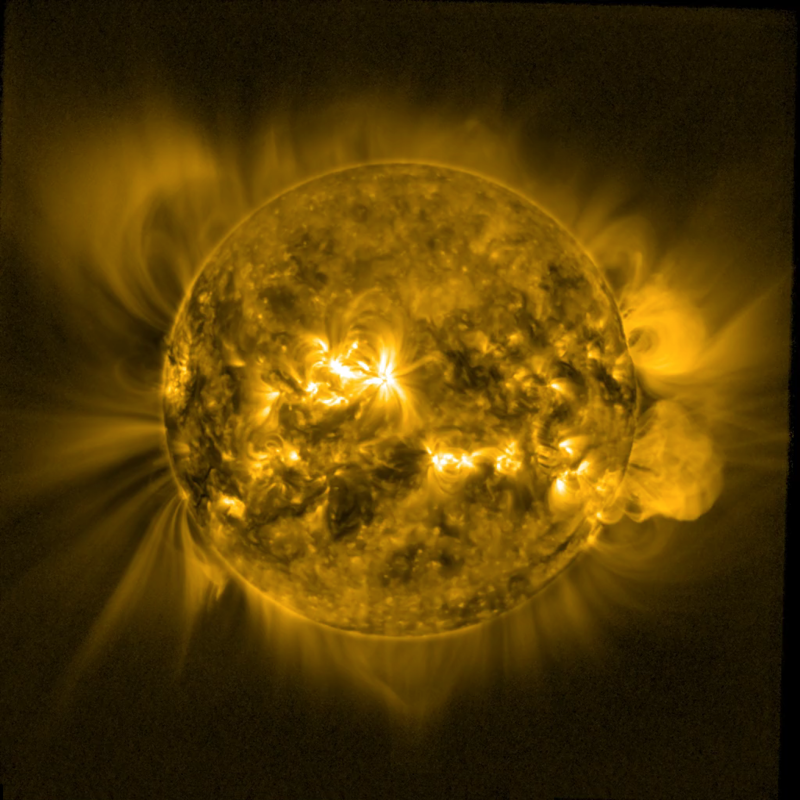 These observations show that the corona is bright in extreme-ultraviolet at heights much greater than scientists had previously anticipated and show the corona's complex, evolving three-dimensional structure as the Sun rotates. 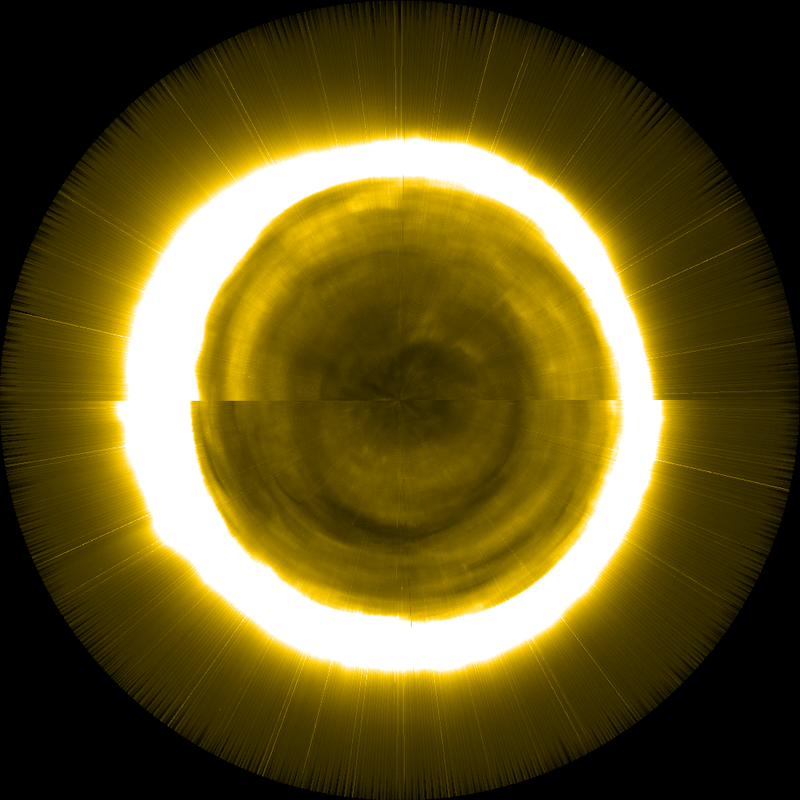 Click the image above to view a movie of the changing solar corona. 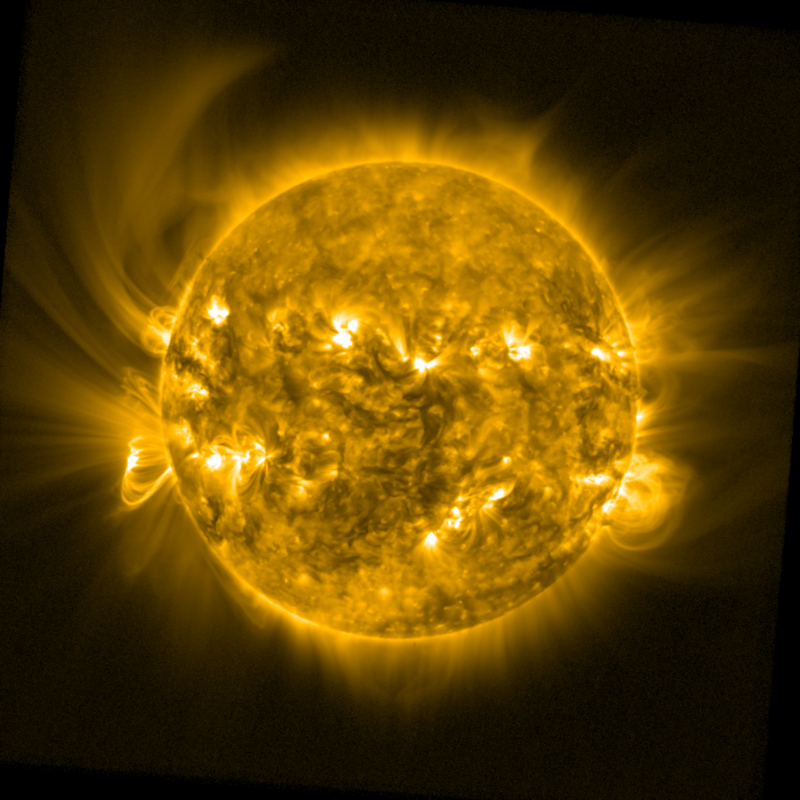 Dramatic eruptions from the Sun: The activity of the Sun increases and decreases following an 11-year activity cycle, and we are currently near the maximum. In periods of high activity, the Sun regularly produces intense luminous flashes called solar flares. Those flares are among the most energetic events in the entire solar system: large flares can release more energy then has been generated on Earth in all human history. These flares are often associated with ejections of high energy particles into inter-planetary space. In some cases, these particles reach the Earth and produce magnificent aurorae - and sometimes perturb our communication and navigation systems. 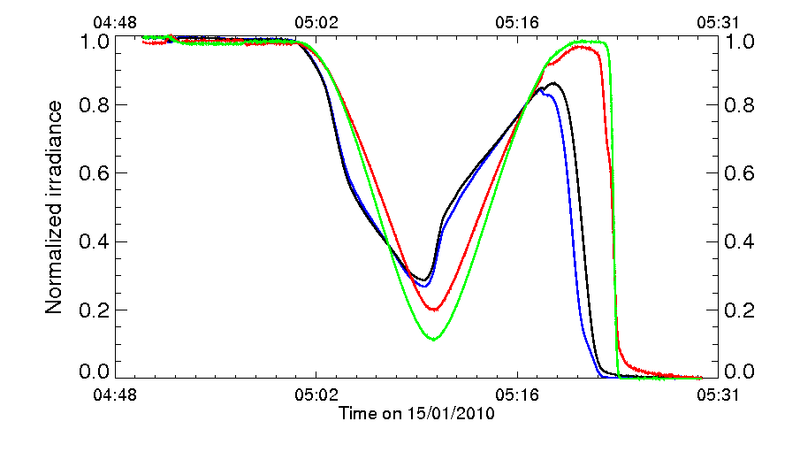 Flares are best seen in extreme-ultraviolet and X-rays and are therefore particularly well observed by SWAP and LYRA, and these data are used by space-weather forecasters. 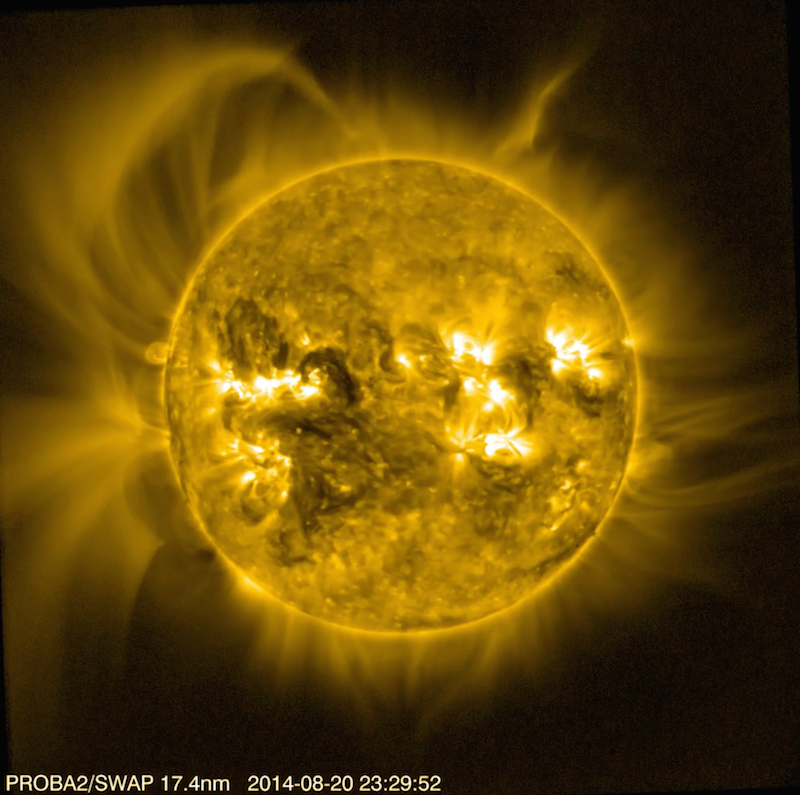 On October 14, 2014, one of the largest active regions of the current solar cycle rotated into view on the Sun. 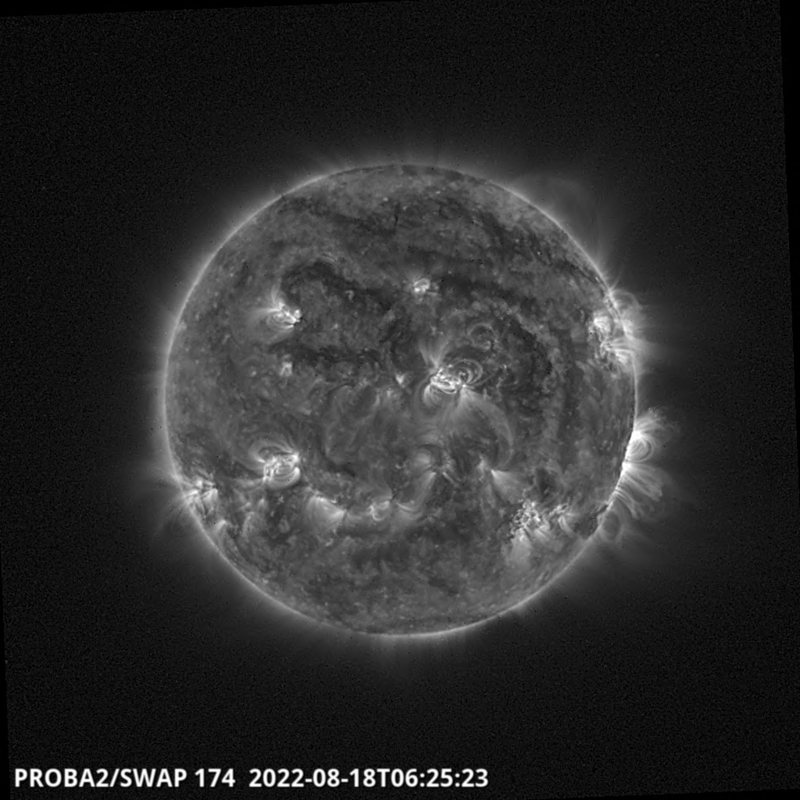 This region produced a large solar eruption and flare that generated a spectacular system of magnetic loops on the Sun. SWAP observed this dramatic event, which unfolded over several days and generated one of the most spectacular movies of its five-year life. Click the image above to view a movie of the spectacular eruption that began on October 14. 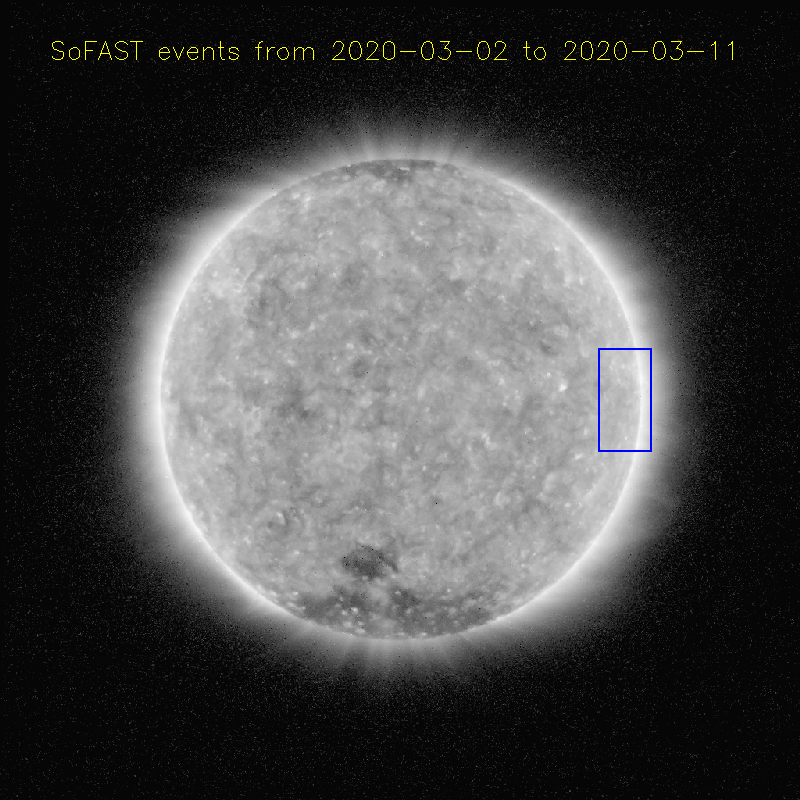 As this region crossed the Sun, it produced multiple large X-class solar flares, the brightest class of flares there is, making the period between October 17 and October 27 the most action packed of the present solar cycle. 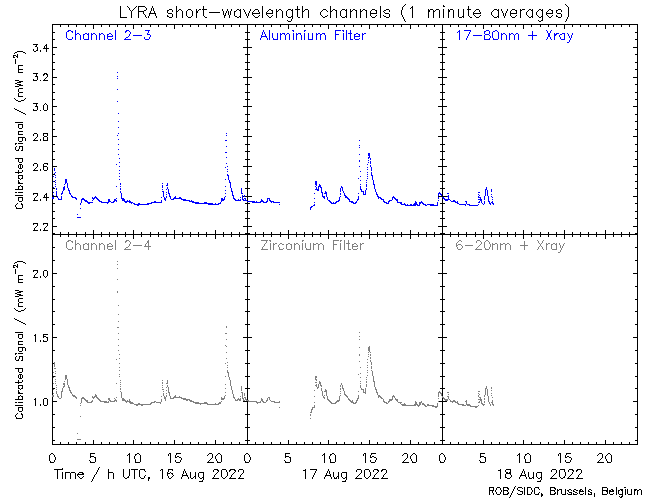 LYRA observations provided an unprecedented view of these flares. 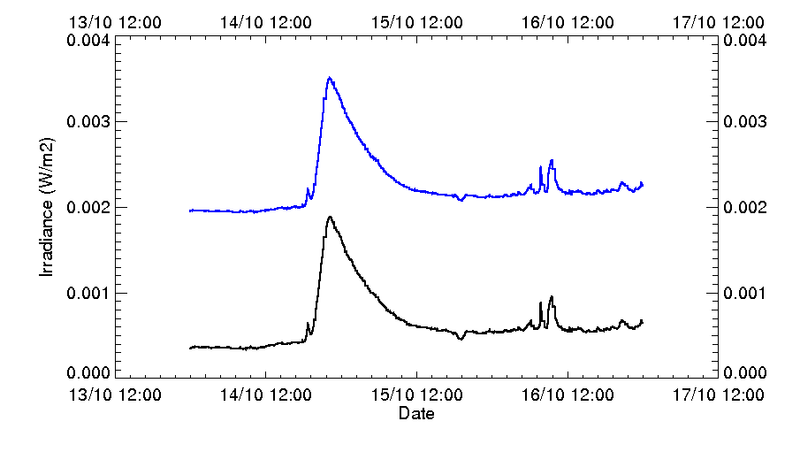 A long-duration flare observed by LYRA in October 2014. 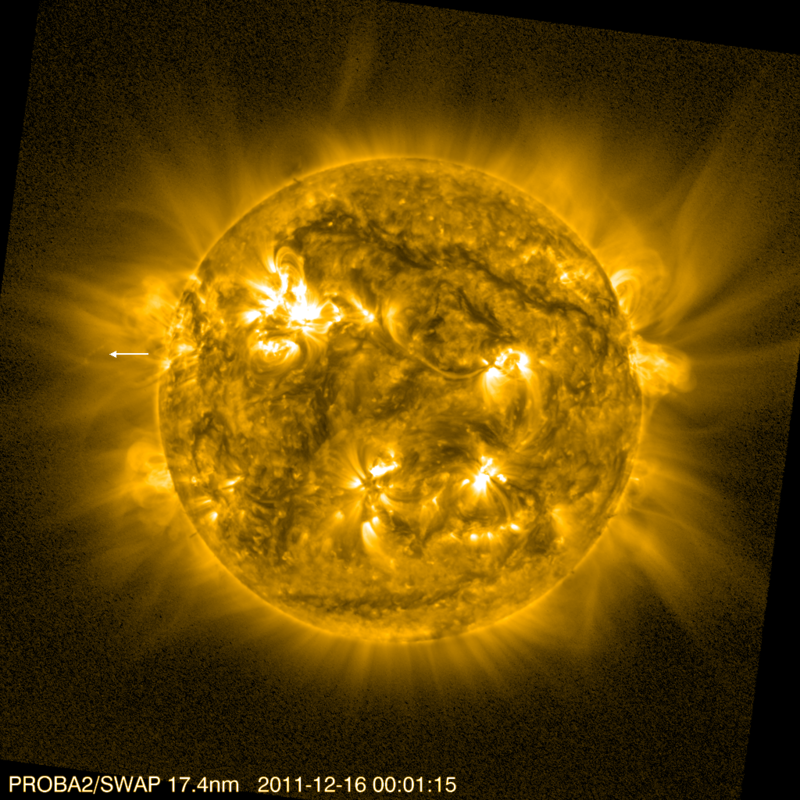 This was the first flare emitted by the large active region and is the flare associated with the SWAP movie above. 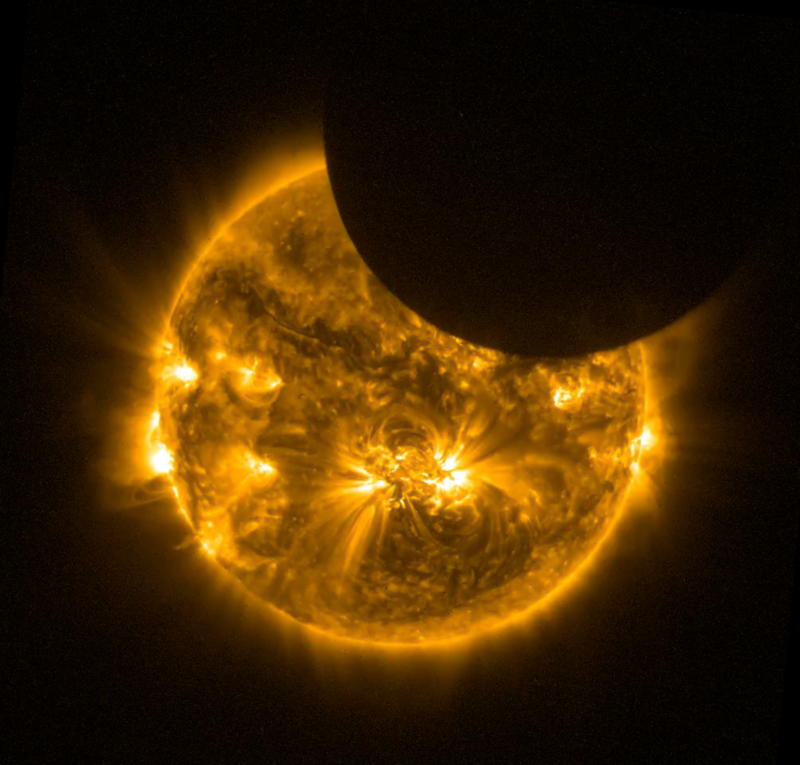 Click on the image to see a SWAP movie of the most recent solar eclipse, from 23 October, 2014. 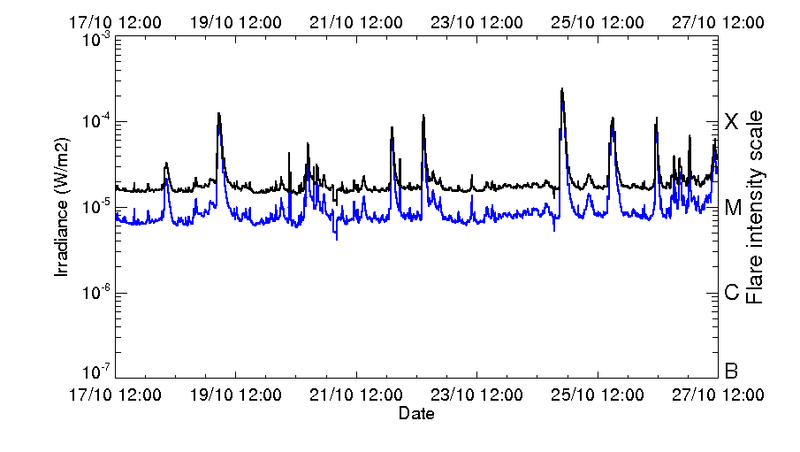 LYRA light curve from the first eclipse observed by PROBA2, a only few days after the instruments were switched on. The distortion in the black and blue LYRA curves are caused by a massive bright active region in the northern hemisphere of the Sun. A SWAP movie of the event can be seen here. Comet Lovejoy: SWAP is among the only EUV telescopes ever to observe a comet. In 2011, Comet Lovejoy passed within about 800,000 km of the surface of the Sun, barely more than twice the distance between the Earth and the Moon. Nobody expected the tiny, frozen comet to survive its fiery encounter with our star, but it emerged from behind the Sun apparently intact, and the images of the passage have yielded valuabe information about both the comet and the solar corona. Click the image above to view a movie of SWAP's view of Comet Lovejoy's close encounter with the Sun. ​A video about the mission, including simulations of the spacecraft orbital injection, originally released at the time of launch, is available via the ESA website. PROBA2's achievements are the result of contributions from many partners, both in Belgium and abroad. The PROBA2 Science Center team gratefully acknowledges support from the European Space Agency and its Redu Station and PRODEX Program, the Belgian Science Policy Office, the Centre Spatial de Liège, the Physikalisch-Meteorologisches Observatorium Davos, QinetiQ, the Royal Observatory of Belgium and its Solar-Terrestrial Centre of Excellence and Solar Influences Data Analysis Center, and many others as well.